CrankyApe.com is the home of Midwest Recreational Clearinghouse. It is a Minnesota-based business that was started by two high school friends who grew up together playing hockey in the Twin Cities. Go Royals! An idea that started in a basement has now grown from 1 small location, into our beast, with 6 locations nationwide and more are on the radar! We specialize in remarketing bank repossessed, insurance repairable recreational vehicles along with consignments. CrankyApe.com provides these items for purchase by the general public via an online electronic bidding system. 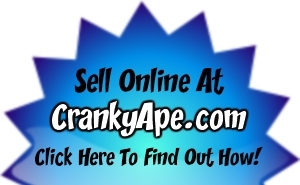 Please browse through the inventory listings and enjoy your time on CrankyApe.com. For more information on registering to bid on our site, please see our FAQ page for details or contact us at CustomerService@CrankyApe.com. O ur sales team and client services division provides specific process information to each of our clie nts throughout the sale. If you are an insurance adjuster or financial institution agent and would l ike more information on selling your bank repossessed or insurance repairable items, please contact us at TheApe@CrankyApe.com.